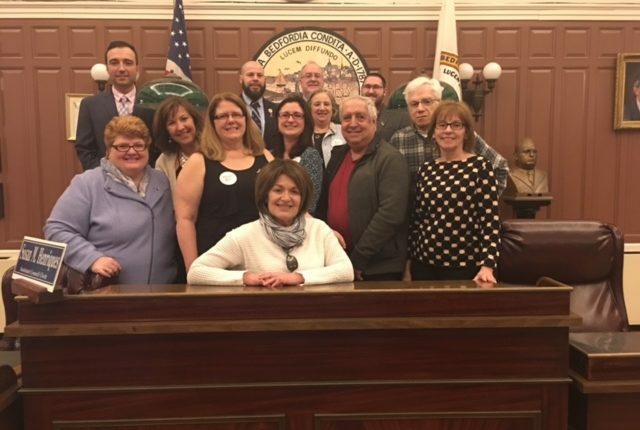 Southcoast Centers for Cancer Care staff, patients and patients’ loved ones were on hand on March 16 when the New Bedford City Council enacted a resolution recognizing March 2017 as Multiple Myeloma Action Month. The effort to get the resolution passed was led by the significant other of a patient who passed away due to Multiple Myeloma in October 2016. According to the National Cancer Institute’s Surveillance, Epidemiology, and End Results Program, the disease currently effects more than 100,000 people in the U.S. with about 30,330 new cases diagnosed and 12,650 deaths from the disease in 2016. Multiple myeloma (or myeloma) is a cancer of plasma cells in the bone marrow and is called “multiple” because it can occur at various sites in the body. It causes a variety of adverse health effects, including a weakened immune system, anemia, kidney damage and bone deterioration, and is the second most common blood cancer worldwide.